On Monday morning, a cloud of dark smoke hung above the skyline of the city of Laurel as a massive fire destroyed McNeely Plastics Products Inc. on East 15th Street. 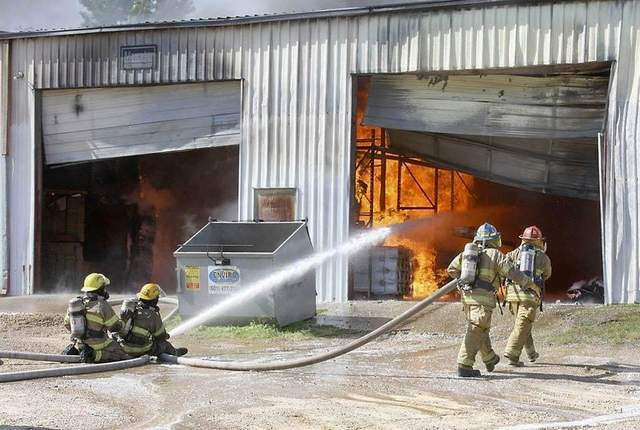 At approximately 8:45 a.m., fire units from four of the five fire stations with the Laurel Fire Department responded to the scene to find the approximately 50,000-square-foot metal-framed building engulfed in flames. Jones County Volunteer Fire Department tankers from all six districts of the county were called in to provide water support to the aerial ladder fire engines. For more than four hours, 11 tankers from Powers, Glade, Sharon, Sandersville, Calhoun, Pleasant Ridge, Hebron, Ovett and South Jones VFDs shuttled water to the scene from nearby city fire hydrants. The City of Ellisville Fire Department also responded with its newly acquired aerial ladder fire engine. According to LFD Battalion Chief David Chancellor, who served as incident commander, the facility served as a distribution center for wax-coated cardboard chicken boxes that were supplied to area poultry plants. Chancellor said the cause of the fire is under investigation, but it appeared to have started when a forklift caught on fire and the propane cylinder on the forklift either discharged or blew up, spreading ignited propane gas to nearby pallets stacked with the wax-coated cardboard boxes. Within minutes the fire had spread throughout the facility igniting hundreds of large pallets stacked with the boxes as well as plastic wrapping material. Several of the approximately 20 firefighters with the Laurel Fire Department, who fought the fire, were treated at the scene for heat exhaustion by medics with EMServ Ambulance Service. Also responding to the scene were Jones County EMA Executive Director Lance Chancellor, Jones County Fire Coordinator Dan McKenna, Mississippi Emergency Management Agency, Mississippi Department of Environmental Quality and Laurel Police Department. Supplying personnel on scene with food, snacks and beverages were volunteers with Fisher of Men in Action from Magnolia Baptist and the Pine Belt American Red Cross. Also responding to assist in providing aid to personnel on scene were volunteers from the Stringer VFD. Officials believe the remaining contents inside the building will continue to burn for several days before eventually burning out.